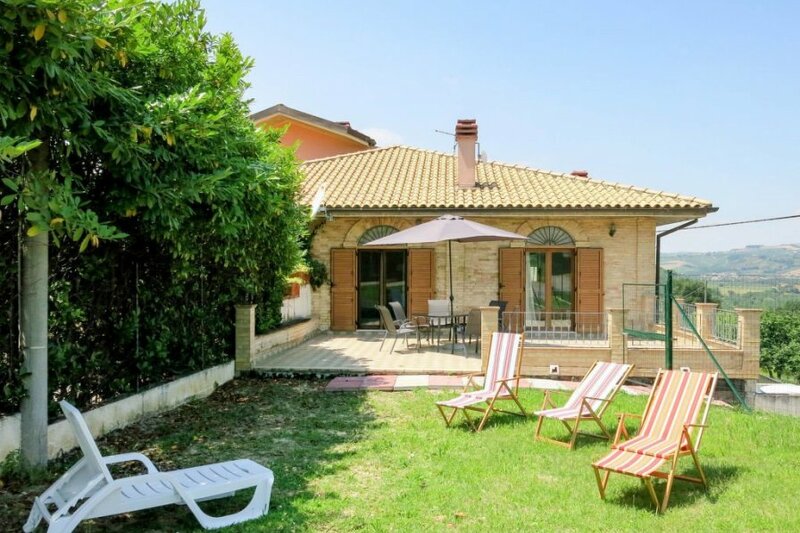 This 2 bedroom villa is located in Picciano and sleeps 4 people. It has WiFi. The villa is near a beach. House attached to another house, 4 people, 3 room/s, 2 bedroom/s, 1 bathroom/s, approximately 75 m², 2 floor/s. Equipment: satellite TV; radio; internet access Wi-Fi (included); washing machine, iron/ironing board; pellet/wood chip heating. € 1.50 per person and day (depending on occupancy). Pellets according to consumption approximately € 5/​15 kg. Final cleaning by tenants or against payment, € 30. Holiday resort tax. Linen/towels available. Change of bed linen/​towels every 7 days included. Deposit € 150 (in cash). Extra bed sofa bed, € 7 per person/​day (on order). Cot/​High chair/​Baby stroller free of charge (on order). Pet 1 pet allowed, € 25 per stay (please advise prior to arrival; additional animals on request only). Access/parking: car park (roofed); parking on the estate. Estate (private use): approximately 70 m², open plot, natural surroundings, lawn. Outdoor facilities(private use): terrace 35 m², furnishing provided, deck chairs, sunshade. The villa is described as good value for money. This villa is located in Picciano. The nearest airport is only 23km away. It is set in a convenient location, just 0 metres away from a beach and 5km away from the city center.